This is an example of mouse performance gesture capture combined with generative algorithms. The artist’s hand gestures generate audio responsive procedural brushes. Note how the left to right western reading convention is used to establish temporal flow. The direction of the flow works as if it were a temporal graphing of the instantiated visual events that form it. This graphing can be seen to resemble the way in which a sequence of aural events compose musical experience. Ljósið (previously known as Let Yourself Feel) from Esteban Diácono on Vimeo. This is a similar example of mouse gestures used to drive procedural complexity. The flow of the particle streams also drifts to the left giving a sense of musical structure. Although we are presented with an overall gestalt, antecedent and consequent events are shown as if fading in memory. 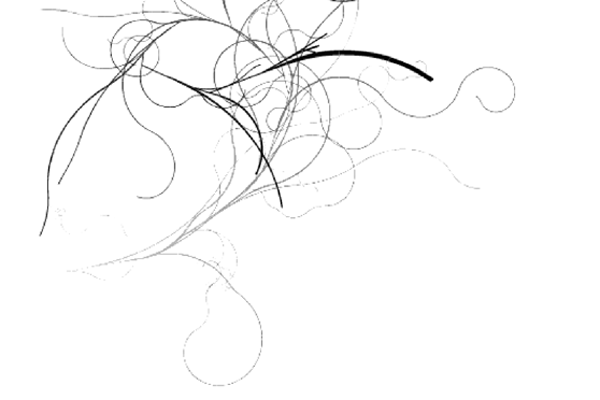 A mouse gesture program that allows the performer to trace paths that branch out in flowing procedural curves.